The deputy chief minister was reportedly said to be miffed after finance, urban development and petroleum portfolios were taken from him. 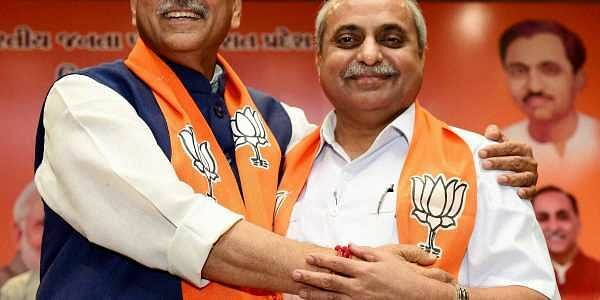 AHMEDABAD: A brewing crisis in the Gujarat government seems to have blown over after BJP president Amit Shah today reached out to sulking deputy Chief Minister Nitin Patel, who had delayed taking charge overnot getting portfolios of his choice in the new Cabinet. Patel agreed to take charge today after Shah called him up this morning and assured him that he will be given a portfolio fitting his "stature" as Number Two in the government. "BJP President Amit Shah today called up early morning and assured me that I will be given a portfolio which is fit for my stature as number two in the Cabinet and as the deputy chief minister," Patel told reporters here. However, Patel didn't disclose whether he would be getting Finance or Urban Development departments which he held in the previous government. "Shah asked me to take charge of my departments, so I will take the charge today. Chief minister Vijay Rupani will meet state Governor O P Kohli in afternoon and give a letter allocating a new department to me," Patel said. However, Patel has maintained that the issue was not about some departments, but about "self-respect". "I had conveyed to party high command to either give me respectable departments or relive me from Cabinet," he said today. Patel said he had been serving the party like a "loyal and disciplined" soldier. While announcing the portfolios two days back, Rupani had said, "It is not true that the minister, who has the finance portfolio, is the number two in the cabinet. Nitin Patel is our senior leader and will remain the number two." Sending feelers to the deputy CM, Patidar quota leader Hardik Patel yesterday said he would extend support to Patel and talk to the Congress to give him the respect he deserved. "If Patel decided to quit the BJP and said 10 other MLAs were ready to quit with him, We will talk to the Congress to take in Nitin bhai and give him a post he deserves," the Patidar leader had said. Senior Congress MLA Virji Thummar yesterday said Patel would be made the chief minister with the Congress' support if he quit the BJP. The opposition party, however, clarified that Thummar was speaking in his personal capacity and described the row over portfolio distribution as the BJP's "internal matter". The BJP and Congress hold 99 and 77 seats, respectively, in the 182-member House.